In the past, musicians have often needed their computers to be physically large, to house several soundcards used in tandem, three or four hard drives, and the usual assortment of graphics, modem, and other expansion cards. For many of us, however, the situation has changed over the last few years. Now that hard drive sizes have increased, most of us never need more than one or two, and since most modern soundcards provide the majority of features we need in one neat PCI card, and the graphics card has moved to its own dedicated AGP slot, we simply don't need six PCI slots either. With this in mind, Red Submarine are now offering two PC systems designed specifically for musicians who value their space as much as their specification. The cutest is undeniably the Micro-Shuttle, which is claimed to be the smallest computer available at 18.5 x 20 x 30cm. Despite its small dimensions it can house a hard drive of up to 200GB, a 3GHz processor, and 1GB of DDR memory, though there's only one AGP and one PCI slot. For those of us who have more cards to fit, the Mini-Sub under review here still manages to be considerably smaller than most desktop systems, with a width of just 36cm, a height of 14cm, and a depth of 43cm — about the size of video recorders from a few years back. 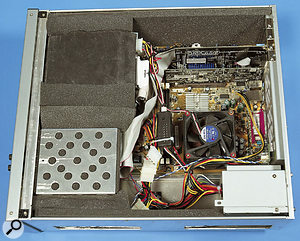 However, it still has one AGP and three PCI expansion slots, and manages to be smaller by incorporating a smaller Micro-ATX format motherboard (see Case Sizes box) and a PSU whose internal fan vent faces the motherboard, along with two 5.25-inch front-panel drive bays, and two internal 3.5-inch ones for hard drives. No floppy drive had been fitted in the review model, but this won't be a loss to many musicians, and you can replace one of the two 5.25-inch bays with a 3.5-inch front-panel adaptor if you really need one. With its aluminium construction and black bezel trim, the system case was instantly recognisable as a Lian-Li product — in this case the PC9300. Front left to right across the bottom half of the front panel are two USB 2.0 ports, a red drive activity indicator, a recessed reset button, a blue power indicator, and a power switch, while on the review model the two 5.25-inch drive bays housed an LG CD-R/W drive capable of 52x read and write and 24x rewrite speeds, and a Terratec DMX 6Fire soundcard module. The back panel looked almost identical to that of a Midi Tower case, with its selection of PS/2 mouse and keyboard ports, a further four USB 2.0 ports, a single serial and parallel ports, plus the usual selection of redundant motherboard sockets. Like the popular PC60 model, the PC9300 comes without a PSU, and Red Submarine had sourced a low-noise 235W model — not that powerful by today's standards, but good enough for this machine unless you later want to significantly expand it. They had also taken great trouble to reduce acoustic noise to the absolute minimum. Both of the case side panels had a sandwich of damping panel/acoustic foam, while the top panel was also completely covered in damping material. All unused space on the front panel plus the one empty internal 3.5-inch drive bay had been filled with blocks of acoustic foam, while the single 80GB 7200rpm hard drive was surrounded by a custom acoustic sleeve of damping pad and foam block (with both front-panel 5.25-inch bays already used, there's no space to fit a Silent Drive sleeve). The Asus P4B533-M motherboard lacks options such as Firewire and integrated LAN, but does offer six USB ports.Photo: Mark EwingThe motherboard fitted was an Asus P4B533-M, one of the family of at least four P4B533 socket 478 models featuring the Intel 845E chipset and supporting Pentium 4 processors up to 3.06GHz. They also support the latest hyperthreading technology, which Intel introduced with the 3.06GHz model, and which fools Windows into thinking there are two CPUs. This only benefits music applications that are specially compiled to take advantage of it, and currently the only one I know of is Steinberg's Nuendo 2. In any case, the review system was fitted with a somewhat more reasonably priced 2.8GHz Pentium 4 Northwood model. To complement the other low-noise components, Red Sub had also fitted it with a Zalman CPU cooler and Fan Mate speed control. This 'M' version motherboard dispenses with the integrated graphics, RAID, LAN, Firewire, audio, MIDI and Gameport options of other models in the series, to provide a more straightforward choice for the musician. There are still six USB 2.0 ports available, and the two 184-pin DDR DIMM slots support up to 2GB of memory using DDR200 or DDR266 DIMMs. However, a single stick of even faster PQI 512MB DDR333 PC2700 memory had been fitted to the review model, apparently because Red Submarine had managed to buy PC2700 RAM for the same price as the required PC2100. By the time you read this they will be offering a more upmarket Asus P4PE motherboard option that does support DDR333 memory, as well as Firewire and LAN for those who want them, for about £30 extra — I think it will be worth the small additional cost. Despite its compact size, the Mini-Sub's case has two 5.25-inch drive bays.Photo: Mark EwingThe two IDE channels support up to ATA100 protocols, which is perfectly adequate for hard drive recording and playback, and the single 80GB Seagate Barracuda V hard drive had been fitted as Primary Master, with the LG CD-R/W drive as Secondary Master. The AGP slot was fitted with an ATI Radeon 7500 graphics card with 64MB of DDR RAM, supporting dual monitors in a variety of configurations with its 15-pin VGA analogue out, DVI out for digital flat-screen monitors, and TV out, and a bundled DVI-to-VGA adaptor for those who want to plug in two VGA monitors. Originally introduced in 2001, the Radeon 7500 chipset doesn't have the fastest 3D performance around, but more importantly, this particular card from HIS doesn't employ a cooling fan, and is a good budget card for dual monitors. 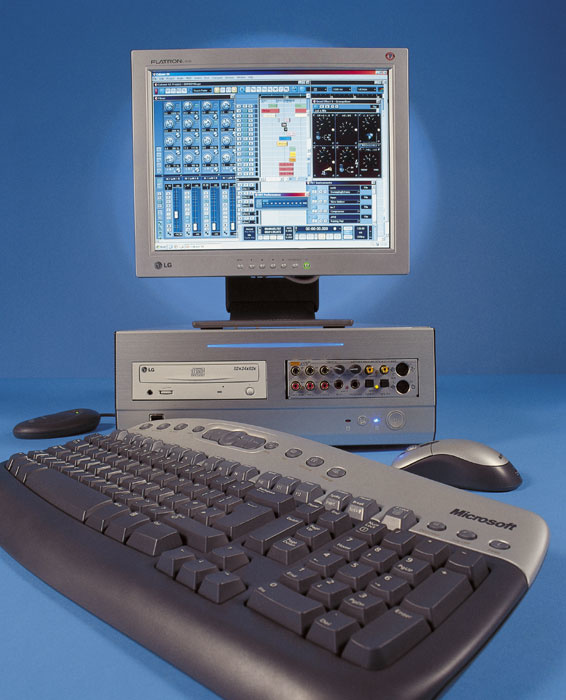 Only one of the three PCI slots was occupied in the review model, by a Terratec DMX 6Fire soundcard; Red Submarine list several dozen other soundcard options on their web site, along with various other system options. This leaves plenty of room for expansion, although you can only install expansion cards up to 'half-length' (about seven inches). Very few are longer than this nowadays, and looking back through my dozens of SOS soundcard reviews, the only ones that wouldn't fit are Creamware's Pulsar and Lexicon's ill-fated Core 32 and Core 2 models. Having fewer PCI slots ought to help avoiding IRQ sharing at the motherboard level, and sure enough, slots one and two get their own interrupt allocation on the motherboard, although slot three does share with USB ports five and six, and the AGP slot shares with ports one and two. Case: Lian-Li PC9300 aluminium desktop, fitted with 235W low-noise PSU, and lined with sound-dampening material. Motherboard: Asus P4B533-M socket 478, with Intel 845E chipset running 400/533MHz system buss, and 2 DDR DIMM sockets supporting up to 2GB of PC2100/PC1600 memory. Processor: Intel Pentium 4 2.8GHz 512kb cache (Northwood B), 4 times 133MHz Front Side Buss. CPU heatsink & fan: CNPS5100-CU Zalman Ultra Quiet with Fan Mate controller. System RAM: PQI 512MB PC2700 (DDR333) CAS2 DDR-SDRAM. Hard drive: Seagate Barracuda ATA V, model ST380023A, 80GB, 7200rpm, ATA100, 2MB cache. Graphics card: ATI Radeon 7500 dual monitor with 64MB RAM. CD-R/W Drive: LG model GCE-8520B, E-IDE interface, 2MB buffer, 52x read, 24x rewrite, and 52x write, buffer under-run protection. Monitor: LG Flatron L1510S TFT flat-screen, with 15-inch diagonal. Keyboard & mouse: Microsoft wireless optical desktop with enhanced 105-key keyboard and wireless optical mouse. Installed operating system: Windows XP Home Edition with Service Pack 1. Installed soundcard: Terratec DMX 6Fire with version 5.00.2000.126 drivers. Installed audio software: Steinberg Cubase SX version 1.0.5.61. The remaining components were of good quality, consisting of one of the well-respected LG Flatron LCD monitors, in this case an L1510S 15-inch model, a Microsoft wireless multimedia keyboard and an accompanying wireless optical mouse, both using PS/2 connections. All three worked well during the review period. Wireless components are popular with musicians because you can still use them well away from their base unit when recording, although this does mean that the mouse is heavier due to its batteries, and the extra keys of this particular multimedia keyboard make it 50 percent deeper than some other models. It incorporates dual-functions for each 'F' key, plus 17 extra user-definable keys that by default open various Microsoft utilities, including six for transport control of Media Player. Sadly it hasn't proved possible to redefine these for use with the supplied Cubase SX. On the software side, Windows XP SP1 had been installed, along with the latest Cubase SX version 1.0.5.61 and Norton's Ghost imaging software, while as often seems to be the case, the CD-R/W drive came with a bundled copy of Ahead's Nero 5.5 CD burning software. Intel's Application Accelerator had also been installed to get the best performance from the Pentium 4 processor. Switching the Red Sub Mini-Sub on lights up a smart six-inch-long blue strip above the drive bays, in addition to the blue power indicator LED, but the biggest surprise was the acoustic noise — or rather the lack of it. While most of the specialist PCs I've reviewed over the last couple of years have been fairly quiet, this is the first one that's been even quieter than my own. Since I've tweaked mine in almost every possible way, this is no mean achievement for a 'production line' model, especially since its CPU is nearly three times as fast as mine. I can therefore pronounce the Red Sub Mini-Sub the quietest PC I've ever had the pleasure to use, thanks to its acoustic lining, extremely low-noise PSU fan, and a carefully chosen CD-R/W drive that idles quietly. The Seagate Barracuda V 80GB hard drive had been divided into two partitions — a 20GB one for system use, and the remaining 60GB for audio, with cluster sizes of 4k and 32k respectively. Dskbench showed the C partition capable of 41MB/second write and 42MB/second read speeds, while the D audio drive managed 41MB/second for both read and write, and 125 simultaneous tracks of 16-bit/44.1kHz audio with a 64k buffer size — as fast as any drive I've yet measured. This is the first time I've tried one of the new Seagate Barracuda V series drives, and I know quite a lot of musicians still search for the popular 80GB Barracuda IV model, since this is claimed to be even quieter. However, both have an ATA100 interface, Softsonic motor, 7200rpm spin speed, and almost identical seek times, and judging by the review model, the V is slightly faster and seems just as quiet. This system's Micro-ATX format will be unfamiliar to some SOS readers, so it's worth comparing it with the more familiar options. The majority of modern PCs house standard ATX-format motherboards, which can be fitted in Mini Tower, Midi Tower, Full Tower or Rack cases. Most musicians opt for a Midi Tower, which typically offers four 5.25-inch drive bays plus four or five internal 3.5-inch bays for hard drives, and two or three external 3.5-inch bays for floppy drives. Rack cases for musicians vary considerably, but typically offer a smaller number of bays, depending on their height, while Full Tower systems provide more space for those with large ambitions, and typically provide six 5.25-inch drive bays, six internal 3.5-inch bays for hard drives, and three 3.5-inch bays for floppy drives. Some companies also offer Mini Tower cases, such as Lian-Li's PC30, which measures a diminutive 21 x 36.5 x 49cm, but still supports a standard ATX-format motherboard, has two 5.25-inch and two 3.5-inch drive bays on the front, and a further three 3.5-inch bays internally. This is effectively a Midi Tower with about three inches lopped off the top, but this is still a useful reduction for those with space problems. The Mini-ATX motherboard format is only slightly smaller at a maximum 11.2 x 8.2 inches compared with the maximum 12 x 9.6 inches of the standard ATX format, and to get a significantly smaller PC means using the Micro-ATX format of the review system, which drops overall dimensions considerably to a maximum of 9.6 inches square. This format still provides reasonable expansion potential, and if you drop any further in size to the ultra-compact Mini ITX format at 6.76 inches square, you're likely to only get a single PCI slot and integrated graphics chip, as found in Red Submarine's Micro-Shuttle PC. Windows had been installed in Standard rather than ACPI mode, while APM had been enabled to allow soft power-down. This is the first PC I've reviewed with the APIC (Advanced Programmable Interrupt Controller) that I discussed in SOS February 2003, but unfortunately the extra interrupts it provides (24 instead of the normal 16) are lost in Standard mode — perhaps Red Submarine should reconsider their decision to abandon ACPI. All the usual OS tweaks had been made, including processor scheduling set to background services, a fixed 512MB page file, Start Menu to the Classic view, Visual Effects set to best performance, System Restore, System Sounds, Automatic Updates, Auto Insert Notification disabled, and so on. Wisely, no Services had been disabled, since it's impossible to tell exactly what an end user may require. Memory bandwidth, measured with SiSoftware's Sandra 2002 Standard, measured 1973MB/second for integer calculations, and 1972MB/second for floating point — around 3 percent lower than the Digital Village and Digital Systems PCs I reviewed recently. I'm not sure why this was, but I suspect that with the DDR333 SDRAM Red Sub could tweak more aggressive timings in the BIOS to make up for this. I also spotted while in the BIOS that Legacy Diskette should have been set to 'None' to prevent the non-existent Floppy A appearing in Explorer. The 2.8GHz Pentium 4 was certainly no slouch when running music applications, and I measured anywhere between 20 and 30 percent improvements compared with a Pentium 2.4GHz Northwood B processor, with Waves Rverb taking just 4.8 percent and the C4 multi-band parametric processor 3.6 percent. The write and rewrite performance of the LG CD-R/W drive also proved to be excellent, although you may have to be a little careful to choose suitable media to achieve the top rated speeds. Digital audio extraction isn't quite as fast, but still pretty speedy at around 40x. The DMX 6Fire soundcard had been set up for a 4ms latency at 44.1kHz, and I experienced no glitching problems running it with a variety of music software, including the supplied Cubase SX, Wavelab 4.0, Pro 53, and various Waves plug-ins. Red Submarine provide a year's on-site warranty support, followed by a further two-year return-to-base warranty. A helpful Confirmation slip is supplied detailing all the components in the supplied system so you can double-check that you've received exactly what you've ordered (not always the case it seems from some suppliers), and then there's a two-page setup guide for beginners detailing all the basic connections, how to connect a TV as primary or secondary monitor, how to restore the two CD-R-disc backup image using the bundled copy of Norton's Ghost 2003 in case of user accidents, and how to create your own updated images. I was impressed with the Quality Assurance Worksheet, which details all the tests carried out on the system, as well as how it has been set up, including IDE Master/Slave setup, partition info, BIOS settings, physical checks, soundcard audio and MIDI driver settings and checks, audio software setup, plus details of any dual boot (not used on this system) or ghost image creation. To cap it all, the engineer who completes this comprehensive list is named at the bottom, just in case you have any queries. If you do, technical support can be obtained by both email and telephone during office hours from Monday to Saturday. When I first saw the ads for the Mini-Sub, I imagined that it must involve some compromise either to performance or expandability. However, this simply isn't the case: you can install processors up to 3GHz, two hard drives, and still have two PCI slots available after fitting your soundcard and AGP graphics card, just in case you need a modem for instance. Few people will miss a floppy drive, but you could still add a USB floppy if you really needed one. The Mini-Sub should certainly interest any musician who is fed up with big PC cases that are full of hot air. Of course you can't build a PC without generating some heat, but Red Submarine have managed to put together a significantly smaller system than most, with the fastest processor I've tested to date, and still cool it without resorting to noisy fans. It may not be totally silent, but it's the closest to it that I've yet experienced on a production PC, and this is particularly commendable considering its 2.8GHz CPU. Significantly smaller than standard PC cases. Commendably low acoustic noise level. Still space for two more PCI cards and one more hard drive if required. 235W PSU might need upgrading after further expansion. Installing Windows in Standard Mode loses the extra IRQ advantages of the APIC controller. Floppy drive option not disabled in BIOS. The Mini-Sub is the fastest, quietest, yet smallest desktop PC I've reviewed to date, but manages to do all this without significantly sacrificing expansion potential. Total system as reviewed, including LCD screen, Cubase SX, and Terratec DMX 6Fire, £2199; basic system as reviewed but without monitor, music software, or wireless keyboard/mouse, £1399; basic system as reviewed without monitor, music software, wireless keyboard/mouse, or acoustic insulation, and with 2.4GHz instead of 2.8GHz processor, £1165. Prices include VAT. Red Submarine +44 (0)870 740 4787.